Emily is sitting in the park thinking about the argument she had just had with her mum and how she didn’t mean anything she had said to her. She all of a sudden realised the time “oh no I’m ten minutes late now mum will be even more annoyed with me” she says. Emily quickly starts to run home trying not to run into people or things. She arrived home but to her amazement there isn’t an angry mum waiting to tell her off at the front door. “Mum” Emily shouts “mum” but there was no reply so she shouts again “mum are you there”. Emily starts to look around the house but she can’t find her anywhere “ok then if she’s not here there will be a note” thinks Emily. So she begins looking for a note but there isn’t one anywhere. Emily then spots something on the floor “what’s this” says Emily. To her surprise it was her favourite book on the floor “I’m sure I didn’t leave this here” says Emily confusedly. Emily picks up the book and looks at the open page and there was her mum in the picture on the page and in shock she drops the book on the floor. Then Emily remembered the story in her book about the pixie king who desperately wanted a wife and who had a secret labyrinth. Emily starts crying and mutters to her self “why my mum out of all the people he could pick why my mum. When she had finished crying she turned around and there was the pixie king staring at her and laughing. “What have you done with my mum?” she cries. “If you really want to know ill take you there just close your eyes” says the pixie king. Emily closes her eyes. Emily opens her eyes and finds her self in a dusty field where all the grass is dead and in the distance she spots at the entrance of a labyrinth. The pixie kind returns and says “your mum will be turned in to my wife and will forget you and everything unless you get there in time which you wont,” laughs the pixie king. The pixie king vanishes “well how hard can it be” says the pixie king. The pixie kin g then reappears and says “oh and one last thing you have till 12:00 to get to my castle and give your mum this apple it will be too late”. Emily take the apple he gives her and as soon as she takes it he vanishes. “First I need to get to the labyrinth,” thinks Emily and she starts her walk to the labyrinth. Finally Emily arrives at the gates of the labyrinth “well this is it” Emily says worriedly and with a big deep breath Emily enters. Emily gives a sigh of relief “this isn’t so bad” Emily says. The labyrinth is brightly a colour and everywhere she looks there is different types of berries. “Yum just what I need” Emily says in delight. She reaches out for some strawberries. “NO NO NO don’t eat them do you have no common sense” says a voice from no where “Hello who said that” shouts Emily. Out of nowhere a pink and purple butterfly appears and says “it was me” “you can talk” says Emily in shock “of course I can talk says the butterfly”. “Fine then but I do have common sense and I know that when your hungry your suppose to eat” “oh you must be new around here I’m Pippy. You can’t eat those berries they make you forget,” says the butterfly. “Hello I’m Emily and thank you” thanks Emily. 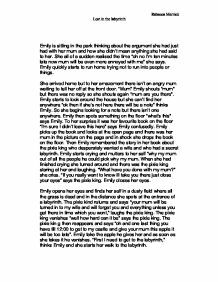 “One last thing how do you get to the pixie kings castle” asks Emily “well first you go left and I’m really sorry but you’ll have to work out the rest because I don’t want the king after me but if you ever need help just call, bye” says pippy and fly’s of. Emily follows pippy’s instructions and goes left. Emily then notices that every single path she takes is a different colour. Emily continues walking and when she turns the corner she hears an “oww”. She looks down and notices a worm wearing a black jacket and a top hat “this place just gets stranger and stranger” mutters Emily. “I’m not weird and you just kicked me which hurt” shouts the worm “I am very sorry” apologises Emily “are you ok” “yes yes I’m fine, I’m wiggle” replies the worm. “Hi wiggle, I’m Emily” says Emily “do you know the way to the castle” asks Emily “yes you go left and follow the path” says wiggle “thank you” says Emily thankfully. Emily turns left and follows the path. Emily arrives at the end of the path but she comes across a dead end. “Well that’s great,” she says. A voice from nowhere then says, “well you shouldn’t trust strangers” Emily turns around and sees wiggle. “Why would you do that” Emily says Shockley “well I couldn’t really tell you the way, I mean who knows what the pixie king would do to me but I’m telling you it wouldn’t be nice?” says wiggle. “Fine then I’ll do it by my self, GOOD BYE” shouts Emily. Emily goes back down the path and turns the corner and she sees a little pixie wearing a red and green outfit jumping on ladybirds. “Hey stop” Emily shouts at him “why should I there horrible things” replies the pixie. Emily picks up the ladybird, the ladybird pricks her. “Oww it pricked me” she drops the ladybird. “Well what do you expect” the pixie says “well not that” says Emily. “ Who are you any way” asks Emily “who me” says the pixie “ I don’t see any one else around” says Emily “oh I’m pixel” replies the pixie. “Please can you help me get to the castle” asks Emily. The Significance of Names in Rebecca. She was a few years younger than her new housemate, but she adored him, and him her. They became inseparable, re-built the old house together, married. Inseparable until the day the drunk driver took her life, and the life of Timmy's unborn sister with it. She was sure Ian was out for revenge. After a long hard think and cup of coffee, she went to visit Alexis. She knocked on the door and waited patiently. Alexis opened the door and moaned, 'Oh, it's you.' 'I heard that Camille left you,' said Beth, 'and I'd like to apologise for that. "Yes. Yes I am. And I don't feel one ounce of remorse," I smiled grimly beginning to walk away but turning to look back once more. "Bye...baby boy," I sneered, the corners of my mouth twitching up into a smile. Chapter 2 BILLY BLACK MY BIKE'S TIRES SPUN HASTILY ON THE BLACK COBBLED STREET, THE brakes squeaking every time used. Still in Jordell's arms, she gave us a look to say she didn't believe us, so we both stared at each other, in conclusion to try and figure out what to do. We looked at each other for sometime, completely clueless of ways to help the situation. For a brief moment it looked like my house had eyes. But in a flash the image was gone from my mind. I was half-way round what was turning out to be a pretty uneventful bike ride, when I saw a leg sticking out of the bracken to my left. and grateful; she was a plain, awkward girl, and had a patient recognition of the fact. But her mother was ambitious, more so than her father, who was rather pugnaciously satisfied with what he had, and not easily disposed to change. Though she fervently desired to be respected and recognized, the narrator still had not formed an identity for herself. This is proved in this passage: I took the receiver off with trembling hands, and "Who is it?" I said, "Who do you want?"